In decades past, Nissan has concentrated on producing utility vehicles and pick-ups which adhere to strict efficiency standards above anything else. For this reason, Nissan vehicles have remained small and, to be a bit blunt, quite unattractive. Nissan recognizes that the majority of people who need pickup trucks for work and daily commercial activities need power, size and versatility on top of a tradition of fuel efficiency. The newest Nissan Titan is a complete package heavy duty pickup that successfully crosses the boundaries between aesthetic appeal, power and convenience in commercial work environments. The second new feature of the Titan is a bed that is specifically designed to be useful for storage and commercial projects. Most heavy duty trucks have beds that are wide and long, but they are nothing more than motorized wheelbarrows. Nissan has created a unique box for the new Titan that features the company’s patented Utili-track Channel System. Paired with a thick spray-in bed liner and border cages, this innovation makes loading and unloading simple. If these two features were not enough, the new Nissan Titan has adopted a model design often overlooked by efficiency trucks. Since the Titan is now so capable of hauling, why not make it perfect for hauling either materials or people? The new Titan is now a full-sized King Cab. Nissan can now get an entire work crew to the job in one trip, and in ultimate comfort. High-grade step rails make it easier to load up, and extended chrome features make it a work ride that any crew will be proud to be seen in. 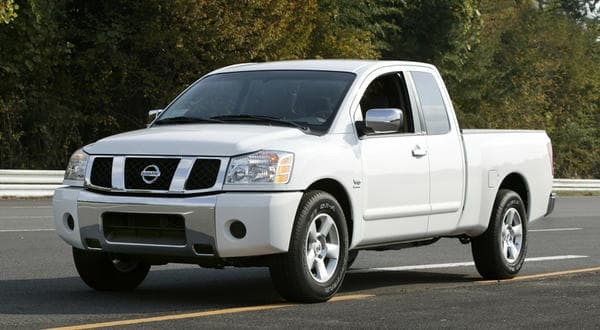 Nissan has entered the competitive world of versatile, high-performance commercial pickup trucks. Watch it outwork the rest of the field!